Roy Orbison alias Roy Kelton Orbison, født 23. april 1936 i Vernon, Texas og død 6. december, 1988 i Hendersonville, Tennessee. Kælenavn: "The Big O". Genre: Rock, rockabilly, pop, country. Instrumenter: Guitar og mundharpe. Hans kendetegn var falset-sangen og solbrillerne. De sidste blev hans varemærke ved en fejltagelse. Han havde en kraftig bygningsfejl på øjnene og kunne ikke se uden stærke briller. Til en af sine tidlige koncerter havde han glemt brillerne i flyet og blev nødt til at bruge det eneste forhåndenværende: Et par solbriller med styrke. Hans image var skabt, og han kom aldrig til at lægge solbrillerne igen. 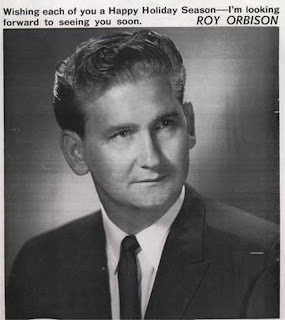 Roy Orbison lå første gang på hitlisten I 1956 med “OOby Dooby”, men hans internationale gennembrud kom i 1960 med “Only the Lonely” fulgt af ”Crying” i 1961. Hans største hit var ”Oh Pretty Woman” i 1964. Orbison var bil- og motorcykelentusiast og i sin storhedstid kunne han få øje på en forbipasserende ny model, som han syntes om, følge efter chaufføren, og købe den på stedet. Han ejede på et tidspunkt så mange biler og motorcykler, at der var nok til et museum. Var i øvrigt også filmentusiast og så op til tre film om dagen. Orbisons kone Claudette var også motorcykel entusiast, men parret blev under en køretur i 1966 ramt af en tragedie, da hun blev påkørt af en lastvogn og døde. Orbison blev ved med at tournere og indspille film men under en tur I England I 1968 modtog han besked om at hans hjem I Hendersonville, Tennessee var brændt ned og hans to ældste sønner var omkommet. Først I midten af 80erne nåede han de samme højder som i 60erne, fordi den psykodeliske rock havde indtaget hitlisterne. Orbison udtalte senere om perioden: “Jeg hørte ikke meget musik, jeg kunne relatere til, så jeg stod som et træ midt i de blæsende vinde og de skiftende årstider, men jeg var der stadig og jeg blomstrede igen.” I 1986 fik han en vedensomspændende revival med nummeret “In Dreams” I David Lynch filmen ”Blue Velvet” og blev I 1987 indlemmet I Rock and Roll Hall of Fame. Året efter indgik Roy Orbison i supergruppen ”Traveling Wilburys” sammen med Bob Dylan, Tom Petty, Jeff Lynne og George Harrison. Lynne producerede Orbison's sidste album “Mystery Girl”, som var på vej op ad hitlisterne, da han døde af et hjerteslag på grund af for voldsomt arbejdspres i 1988 kun 52 år gammel. I Januar 1989, blev Orbison den første musiker siden Elvis Presley, der havde to albums på den amerikanske Top Fem samtidigt. Roy Orbison fik to børn med sin anden kone Barbara Jakobs. Roy Orbison med sin anden kone Barbara. Roy Orbison med sønnen Roy Jr. When Orbison was first in the United Kingdom, he toured with The Beatles. In 1966, his wife, Claudette, died in a motorcycle accident. Two years later, two of his sons were killed in a housefire. Scored his first minor hit in 1956 with "Ooby Dooby". Toured with Eagles in 1980. Had a No. 1 1964 hit with "Oh, Pretty Woman". Elected to the Rock and Roll Hall of Fame in 1987. Elected to the American Songwriters Hall of Fame in 1989. Near the end of his life, he became friends with K.D. Lang after they recorded his 1961 hit single "Crying" as a duet. Was close friends with actor Martin Sheen. Teamed up with Bob Dylan, Beatle George Harrison, Jeff Lynne from Electric Light Orchestra and Tom Petty in the group The Travelling Wilburys. Children: Roy Dewayne Orbison (1958 - September 15, 1968), Anthony King Orbison (1962 - September 15, 1968), and Wesley Orbison (born 1965) by first wife Claudette. 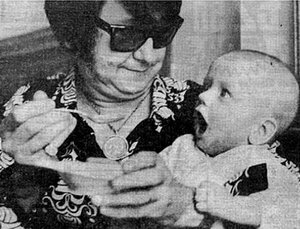 Roy Kelton Orbison Jr. (born October 18, 1970) and Alex Orbison (born 1975) by second wife Barbara. He was voted the 37th Greatest Artist in Rock 'n' Roll by Rolling Stone. David Lynch frequently uses his songs in his films. Was known to insist his backup performers give their best at every performance. Reportedly, one night while touring in Florida he dismissed his regular band (called the Candy Men, after an early hit), then invited the opening group, the Webs, to join him on tour, adopting the Candy Men name. One member of the Webs was singer/songwriter Bobby Goldsboro. His identification with Wayfarer sunglasses began when he went on tour to England in the early 1960s, and forgot his regular specs. 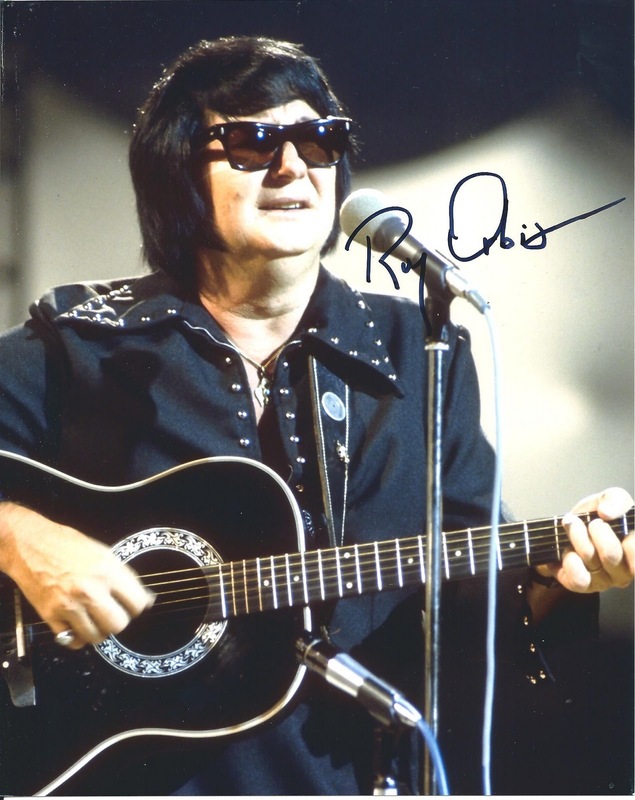 His lenses were prescription, but some fans mistook Orbison for being blind. Longtime neighbor of Johnny Cash, in Hendersonville, Tennessee. Recorded many of his most famous hits from the 1960s with legendary guitarist Hank Garland. Underwent triple heart bypass surgery in 1978. Is portrayed by Jonathan Rice in Walk the Line (2005) and by 'Brian Jones (XXII)' in Crazy (2008/II). Had a vocal range of 3.5 octaves. In 1977, Linda Ronstadt recorded a new version of "Blue Bayou" that became a major success and remained in the country music charts for months. In the early 1980s. Don McLean's recording of "Crying" charted all over the world, reaching Number 1 in the United Kingdom. A duet between Orbison and Emmylou Harris took him to the country music Top 10 and crossed over into the pop charts. Won Grammy Awards in 1981, 1987 and posthumously in 1991. Rerecorded many of his classic hits in 1987 to critical and commercial success. Toured the United Kingdom three times during 1963. Was a friend of Elvis Presley. Attended the University of North Texas. Biography in: "The Scribner Encyclopedia of American Lives". Volume Two, 1986-1990, pages 674-676. New York: Charles Scribner's Sons, 1999. Made only one movie in his career: "The Fastest Guitar Alive" (1967) which was offered to him after Elvis Presley, his friend, turned it down. Both he and his friend Elvis Presley suffered a heart attack in their bathrooms. Orbison was hospitalized but died. First saw Elvis Presley in concert in 1955. Presley was in his concert and entered in backstage the next year. Orbison kept telling about Elvis' visit to his friends. He offered his first big hit song "Only the Lonely" (1960) originally to Elvis Presley, but unfortunately all the material for Presley's next album had already been chosen. Roy later offered the song to The Everly Brothers who had a previous hit with another Roy Orbison composition, "Claudette" in 1958. They suggested he record it himself which he finally did. Last met Elvis Presley in Las Vegas, Nevada in 1976 in the King's last concert in gambling city. Orbison was in the audience and Presley said on the microphone: "Quite simply, the greatest singer in the world, Roy Orbison". Was one of the Million Dollar singers for little record company Sun Records based in Memphis, Tennessee with Elvis Presley, Johnny Cash, Carl Perkins and Jerry Lee Lewis. Recorded the song "Hound Dog Man" (1979) in the memory of Elvis Presley. Of Roy's early compositions "Down the Line" was first recorded by Jerry Lee Lewis (1957) and The Everly Brothers had a charted hit with "Claudette" (1958) #30 US Pop, #1 UK. The steady drum beat signifying confrontation in Roy's recording of "Running Scared" is reminiscent of the arrangement used in Frankie Laine's recording of "High Noon". The look of Marvel Comics supervillain and Spider-Man archenemy, Dr. Octopus is said to be based on him. Ranked #49 on VH1's 100 Greatest Artists of Rock & Roll. Has a star on the Hollywood Walk of Fame for Recording at 1750 Vine Street in Hollywood, California. People often ask me how I would like to be remembered and I answer that I would simply like to be remembered. Whether I'm in London, Sydney or Hong Kong, it makes no difference. There is always someone who knows me. I must be one of the most unloneliest people in the world! I thought maybe in 1964 I could have been swamped by The Beatles. But it turned out the other way round and I was voted Number One vocalist in 1965. There was a lot of loneliness in West Texas where I grew up. We used to say it was the center of everything, five hundred miles away from anything. I may be a living legend, but that sure don't help when I've got to change a flat tyre. I was frustrated as a singer for a long time, particularly when some friendly rivalry broke out between me and a young guy in Texas named Buddy Holly, who, within a couple of months, had a couple of Number One singles and soon had stardom that reached to the Moon. I tried not to take it too hard but when Only the Lonely happened in 1960 I reckoned it was about time too. I was an avid follower of the charts. I lived by them until Only the Lonely - and then I didn't look at them anymore. [After seeing his song 'In Dreams' being used in Blue Velvet (1986)] I was mortified because they were talking about the 'candy colored clown' in relation to a dope deal... I thought, 'What in the world...?' But later, when I was touring, we got the video out and I really got to appreciate what David gave to the song, and what the song gave to the movie - how it achieved this otherworldly quality that added a whole new dimension to 'In Dreams'. Roy Orbison live med sit største hit "Oh, Pretty Woman", 1964. Optagelsen er fra 1965. Roy Orbison med come back nummeret "In Dreams" fra David Lynch filmen 1986.